Can fourth generation technology improve datacentre availability above that required by Tier IV (99.995%) and help achieve a power usage efficiency (PUE) less than 1.1? The primary objective of any datacentre is to achieve the highest possible availability. The Uptime Institute created a tier system (Tiers I-IV) for datacentres. Tier IV fault tolerance (Availability) certification is the highest and requires 2N or 2N+1 duplication/redundancy to give 99.995% availability. Being awarded Tier IV status is advantageous for both the client as it provides the highest level of security of supply and the datacentre as it can receive increased revenue for this enhanced service. The secondary objective of any datacentre is the highest possible efficiency. The Green Grid has suggested a metric known as power usage efficiency (PUE) which can be calculated by dividing the total datacentre power by the ICT Power, i.e. total power supplied to the facility divided but useable IT computing power. However, this gives datacentres an Availability versus PUE dilemma: the Uptime Institute’s Tier IV availability requires duplication and redundancy which naturally introduces inefficiencies, thereby conflicting with The Green Grid’s low PUE requirements. At this point, it must be noted that the two big users of power in a datacentre are: power protection systems (UPS) and HVAC (air conditioning). One Tier IV mega datacentre belonging to Facebook in Lulea, is built inside the Arctic Circle. They have access to free cooling due to its geographical location and it is also built near hydro-power plants which offer multi-path, environmentally clean, reliable power. However, medium and micro datacentres (i.e. almost all datacentres) do not have the opportunity or budget to build inside the arctic circle and are built in and around city and town centres. As a UPS provider, a datacentre’s location is outside of our control but in this article we can consider how the latest UPS technology and innovation can combine the dual benefits of very high availability and very high efficiency in this medium and micro arena. If a datacentre needs “N” power: an N system has 1 UPS module, an N+1 system has 1 “module” of redundancy, a 2N system has 100% duplication (i.e. two independent paths that are normally referred to as “A” and “B”) and a 2N+1 system has both duplication and redundancy. If we consider a 2N datacentre with a 100% design load (i.e. two UPS systems, one supplying A and the other B) the maximum load on each UPS in normal operation would be 50%. If the same UPS systems were in a 1+1 parallel redundant configuration (the most common parallel configuration) then there would be two UPS modules supplying A and two supplying B and therefore the maximum normal load on each UPS would be 25%. However, datacentres never operate at 100% of their design load so if we consider a 2N datacentre with a more realistic 60% (of the design load) as an actual load the maximum normal load on each UPS would be only 30%. If the same UPS systems were in a 1+1 parallel redundant configuration the maximum normal load on each UPS would now be only 15%. As can be seen in Figure 1, even with the latest transformerless design UPS modules there is >3% difference in operating efficiency between the UPS loaded at 50% and the UPS loaded at 15%. When you consider that datacentres are running 24x7x365 and need a lot of power, 3% “wasted” energy represents a significant amount of power and therefore money over the working life of the datacentre. What the above demonstrates is that using monobloc UPS and the Uptime Institute’s Tier IV “2N” and/or “2N+1” suggestion(s) to achieve Tier IV levels of availability directly conflicts with The Green Grid’s requirement for a very low PUE. But what if 4th Generation Modular UPS were used? 4th Generation Modular UPS has a number of features which ensure high availability AND reduce PUE. From an operating efficiency perspective, 4th Generation modular UPS technology has two very distinct advantages over the previous technology. These advantages are a class leading “true on line” efficiency curve (see Figure. 2 below) and the ability to enter what is commonly known as an “active sleep” mode. Active Sleep Mode is a user enabled function which only becomes active when the actual load is low enough (as defined by the user). In this mode, all UPS modules in excess of those needed to fully support the load with the required levels of redundancy are put into an active sleep which keeps all UPS monitoring and circuitry alive but inhibits the actively sleeping UPS from switching power, thereby eliminating their switching losses and increasing system efficiency. Using exactly the same examples as above, our 2N datacentre with a 100% design load (i.e. two UPS systems, one supplying A and the other B) the maximum normal load on each UPS would still be 50%. However, if the same UPS systems were in an N+1 parallel redundant configuration where N was, say, 5 modules, then there would be 6 UPS modules supplying A and 6 UPS modules supplying B but this time the maximum normal load on each UPS system would be increased to 42%. As previously stated, datacentres never operate at 100% of their design load so if we consider a 2N datacentre with a more realistic 60% (of the design load) as an actual load the maximum normal load on each 5 module UPS system would still be 30%, however, if the same UPS systems were now in a 6 module parallel redundant (i.e 5+1) configuration and active sleep was enabled the maximum normal load on each fully switching UPS module would now be 75%.It is a given that to minimise power losses (and hence minimise PUE) a UPS needs to operate at the best point of its efficiency curve. A system which is too small will be overloaded, compromising reliability and availability. A system which is too large will waste energy, be inefficient and costly to run. It will also cost more than necessary to purchase and maintain due to its size. Scalability and flexibility is therefore essential to ensure the continual ‘right sizing’ of the UPS and is easily achievable with the latest 4th generation modular UPS. 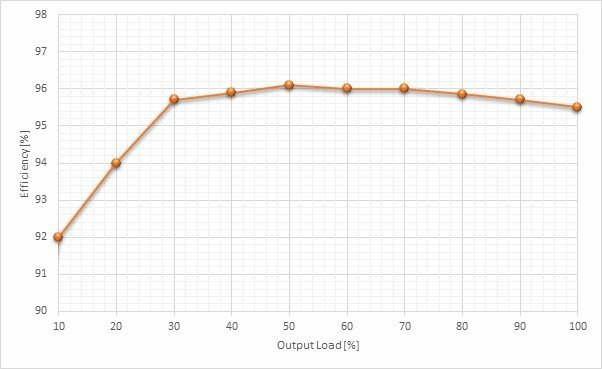 The efficiency curve of 4th generation modular UPS is also much flatter with efficiencies of greater than 96% now achievable even with vey low load levels in the teens. This is how 4th generation modular UPS, when correctly configured, can help minimise PUE. We have shown above how system configuration can minimise PUE but does the same configuration maximise availability? Availability is MTBF divided by the sum of MTBF plus MTTR. Availability is maximised when Mean Time Between Failure (MTBF) is maximised and Mean Time To Repair (MTTR) is minimised. 4th generation modular UPS maximise MTBF in a number of ways. Distributed active redundant architecture (DARA), provides a significant improvement over previous UPS system designs. With DARA, each module contains all the power elements of a UPS – rectifier, inverter, static switch, display – and critically – all control and monitoring circuitry. This places it above older designs that have a separate single static switch assembly and separate control or intelligent modules (and therefore single points of failure). As all 4th generation UPS modules are 100% complete UPS, the fast, simple “hot swap” replacement of a faulty module guarantees a UPS repair regardless of the problem. The key point is therefore speed of repair and a 4th generation modular UPS module takes less than 3 minutes to replace and MTTR is minimised.